Joe Grabowski is an avid scubadiver who wants to share his passion for exploration and conservation with his students. This year, he was named an Emerging Explorer by National Geographic. 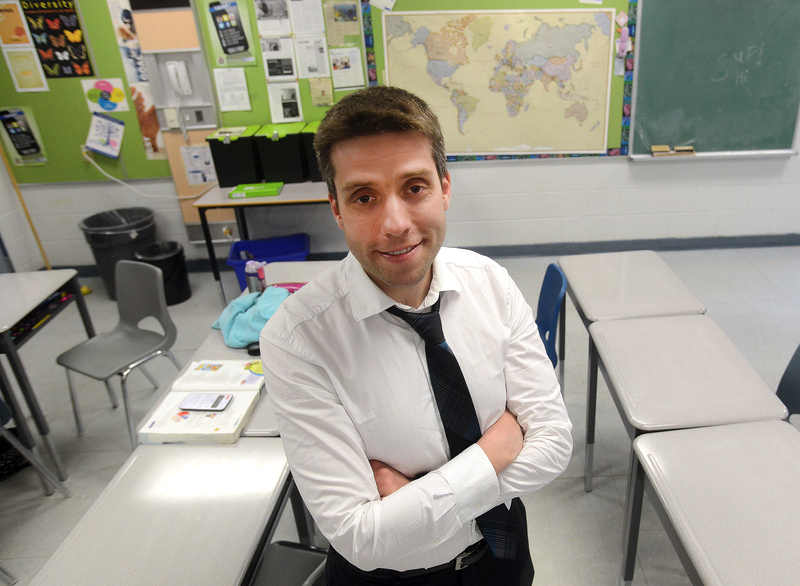 Grabowski teaches at St. John Catholic School in Guelph, Ont. and is the founder of the non-profit organization Exploring by the Seat of Your Pants (EBTSOYP). More than 3,000 classrooms participate in its programming throughout the school year, including 15 to 20 Google Hangouts a month and special full-day events. Next year, they plan to integrate “on-call” hangouts, where classrooms can sign up for spur-of-the-moment adventures. Here, Canadian Geographic asks Grabowski about his unique pedagogical approach. What do you focus on in your teaching? A few years ago, I wanted to do something different, especially with my science lessons. I wanted to make them more real for students, more interactive, and introduce them to people out in the field. I started reaching out to scientists, explorers, and conservationists, having them join our class virtually and share a bit about what they do, their adventures and experiences. It all started out of a desire to make the lessons more meaningful and interactive, and add in that element of global citizenship. The first two years it was just in my classroom, and then I decided to launch the non-profit. We run it via Google Hangout. Classrooms can reserve a camera spot, be on screen and interact with the speaker. Or they can choose to watch live via YouTube, so any number of classrooms can watch that way, and even send in questions. It all records to YouTube, so we’re building a library that can be used at any time by anyone. One thing that was important to me when I first started was that it had to be 100 per cent free for classrooms. I know what money is like in the classroom and you have to level the playing the field. You can’t have just certain schools take part all the time because they are in a little bit better demographic. What are the Google Hangouts like? Sometimes it's a guest speaker talking about themselves and how they got into their field, what they do, and they'll share a little lesson with the students, and then go to Q&A from there. Or sometimes we’ll do a virtual fieldtrip, like go to Antarctica and hang out at a penguin colony. We started sending satellite units out into the field with scientists and explorers. With these units plugged into their computer, they can broadcast from pretty much anywhere on the planet. Two weeks ago, one of our units was on the Clipperton Atoll, one of the most isolated coral islands on the planet. It’s very rare to get permission to go, but there was a Canadian team there and we did the first-ever live broadcast. We learned about shark sanctuaries and marine protected areas; it was a great opportunity for students to see spots where few people get to venture. What has been most rewarding for you with these experiences? When I decided I wanted to be a teacher it was about sharing my passion for science and exploration, and my worries about what we’re doing to our planet. Through EBTSOYP I’ve been able to amplify that message from 25 to 30 kids a year to tens of thousands. It’s incredibly rewarding. We once wrote open letters to the premier of western Australia because we heard they were going to start killing sharks of a certain size near beaches. They wrote to the premier and said, 'we don’t think you’ve done enough research and here are the reasons this is a bad idea'. He wrote back and said, 'thanks, but you don’t know what you’re talking about'. They wrote again with even more research. In the process, we made international headlines and did some conservation projects. That was a wild lesson for the students. They got to see that their voice can carry and have an impact, even on the other side of the world. These kinds of experiences show them what it means to be a global citizen and that they’re not as removed from what’s going on in the world as they think. What do you think these sorts of projects contribute to raising awareness for exploration and conservation? A big reason I started EBTSOYP was that I wanted to introduce students to important issues around the world, exciting new places, positive role models, and new career paths they may never have thought about. There is this rumour that everything has been already been explored, but that’s ridiculous. There’s so much to figure out about our planet — we’ve barely scratched the surface of exploring our oceans. It’s crazy to say there’s nothing left to discover.